Received May 12, 2018; Revised July 9, 2018; Accepted July 23, 2018. Non-operative management has been preferred in blunt spleen injury. Moreover children are more susceptible to post-splenectomy infection, spleen should be preserved if possible. However, splenectomy is inevitable to patients with severe splenic injury. Therefore splenic autotransplantation could be the last chance for preserving splenic function in these patients although efficacy has not proven. Here we reported four cases of children who were underwent splenic autotransplantation successfully after blunt trauma. In order to preserving spleen function in patients with splenic injury, non-operative management is preferred . However, splenectomy is inevitable in some patients with severe splenic injury. In such cases, splenic autotransplantation may be the last chance for preserving spleen function. Nevertheless, the efficacy of splenic autotransplantation remains controversial . Moreover, with the development of better vaccines and antibiotics, the risk of overwhelming post-splenectomy infection (OPSI) has become lower, which reduces the need to preserve spleen function . However, young children have reduced antibody-production capability. Therefore, splenic autotransplantation may be meaningful in children. Here, we share the experience from the four cases of splenic autotransplantation in children who underwent splenectomy due to trauma. Four patients were underwent splenic autotransplantation after splenectomy between April 2011 and September 2015. The indication for splenic autotransplantation was provided as follows: age, <15 years="" viable="" normal="" spleen="" tissue="" detected="" after="" splenectomy="" no="" intra-abdominal="" contamination="" from="" bowel="" injury="" two="" patients="" had="" incurred="" injury="" following="" the="" pedestrian="" traffic="" accident="" while="" the="" others="" had="" the="" fall-related="" injury="" one="" patient="" had="" a="" liver="" injury="" and="" another="" had="" brain="" injury="" along="" with="" spleen="" injury="" the="" injury="" severity="" scores="" iss="" are="" 11="" 34="" 41="" and="" 50="" points="" total="" operation="" times="" for="" four="" cases="" including="" the="" procedures="" of="" splenic="" autotransplantation="" are="" 45="" 70="" 85="" and="" 95="" minutes="" respectively="" the="" surgical="" procedure="" of="" splenic="" autotransplantation="" was="" simple="" after="" splenectomy="" the="" spleen="" was="" inspected="" for="" injury="" grade="" viability="" and="" abnormality="" then="" the="" spleen="" was="" cut="" using="" a="" scalpel="" as="" cubic="" shape="" the="" size="" of="" the="" spleen="" graft="" was="" 1="" to="" 2="" cm="" sup="">3, depended on the patient’s weight and the amount of space available in the greater omentum. Four or five spleen grafts were wrapped in the greater omentum and fixed by non-absorbable sutures (Fig. 1). The function of the transplanted spleen was evaluated by 99mTc-labeled heat-denatured red blood cell (99mTc-RBC) scintigraphy and lab tests such as peripheral blood smear (PB smear) and platelet count. 99mTc-RBC scintigraphy was performed at the 6-month follow-up visit (Fig. 2). PB smear was performed routinely for assessing the presence of Howell-Jolly bodies. The platelet count was checked routinely until one year after surgery. Although the patients received spleen autotransplantation, they underwent vaccination according to the typical schedule followed by splenectomy patients. 99mTc-RBC scintigraphy showed that 19 of the 20 transplanted spleen grafts turned out to be viable. The PB smear revealed the absence of Howell-Jolly bodies within 3 months after operation in all patients. Reactive thrombocytosis was present in three patients. In two of these patients, elevated platelet counts were elevated at 7 days postoperatively, and in one patient at 30 days postoperatively. However, the elevations of platelet counts were transient and gradually decreased to within normal range in all cases (Table 1). The median follow-up duration was 22 months (range, 9 months to 5 years). During this period, no short-term postoperative complications (aseptic necrosis, intra-abdominal abscess or intestinal obstruction) or long-term complications (OPSI) were noted. On the other hand, one patient developed poststreptococcal glomerular nephritis 15 months after splenectomy. Streptococcus pneumoniae was detected in the throat culture. Antibiotic therapy was administered, and the patient recovered in 7 days. However, as this patient had already been diagnosed with poststreptococcal glomerular nephritis once before splenectomy, it is difficult to accurately determine the efficacy of spleen autotransplantation in this patient. Splenic autotransplantation was introduced in the 1970s, but its efficacy remains under debate. Because a clear test for spleen function is not yet available, it is difficult to measure the efficacy of spleen autotransplantation. Evaluations based on platelet count, PB smear, levels of immunoglobulin M and serum complement C3, and radionuclide scintigraphy are commonly used, but there is yet no consensus regarding the assessment of spleen function . Moreover, such indirect laboratory findings may be easily influenced by factors not related to the spleen graft. 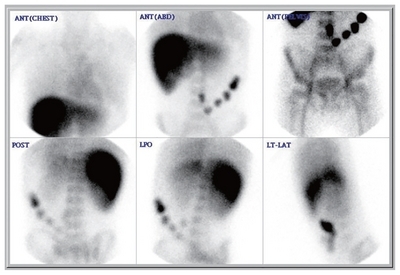 On the other hand, radionuclide scintigraphy techniques are able to demonstrate the viability of the spleen . Spontaneous splenosis after splenectomy could lower the incidence of post-splenectomy infection, and we believe that the spleen graft may have had a similar effect as splenosis. Even though there is no evidence that the 99mTc-RBC scan reflects the graft functions, 99mTc-RBC scan has been a useful tool for detecting splenosis . Several complications associated with splenic autotransplantation have been reported in previous studies. Tzoracoleftherakis et al. demonstrated small bowel obstruction or aseptic necrosis in four of 23 patients, while Moore et al. reported only one complication in 43 patients, although the patient deceased from OPSI after splenic autotransplantation. Büyukünal et al. reported one case of intestinal obstruction in 16 patients. Overall, low rates in complications were reported. Of course there is limitation with small number of cases; no complication was noted in our study. It may be a burden for performing additional procedure of the autotransplantation during splenectomy if the vital sign of the patient is unstable during the operation. However, there was no hypovolemic shock observed during the operation for all cases. It is very important that the surgeon must communicate with anesthesiologist if this optional procedure could be done safely. Though the time spent for the procedure of the autotransplantation was not recorded separately, the overall time for splenectomy was not much delayed because of simple transplantation technique. Taken together, these results suggest that splenic autotransplantation represents a safe procedure. Furthermore, it was shown that, for patients who undergo splenectomy due to trauma, the risk for OPSI in young children is six times higher than the average risk of patients aged 0–12 years . Therefore, splenic autotransplantation might be more beneficial in young children. The greater omentum represents the preferred location for spleen transplantation because of the favorable revascularization, portal drainage, and omental bacterial clearance . However, the optimal amount of splenic tissue to be used for grafting remains a controversial aspect. Petroianu and Petroianu  used 50 g of splenic tissue. Di Carlo et al. suggested that a single graft (4×3×2 cm3) consisting of 35 g of splenic tissue was sufficient to achieve splenic function. In the current study, smaller spleen grafts were utilized because the patients were children. However, the ratio of splenic tissue weight to whole-body weight was not small, as it is known that the ratio of spleen weight to whole-body weight is larger in children. Because using a larger graft of splenic tissue carries the risk of complications including omental tear, aseptic necrosis or abscess, further study is warranted to determine the optimal amount of spleen tissue to be used for grafting. There is no useful tool or evidence yet to prove that the grafted splenic tissue is functional. Therefore, we gave vaccination for all cases in order to minimize the risk of OPSI because it may be an ethical issue for not giving them vaccination for studying the efficacy of splenic autotransplantation. However, 99mTc-RBC scintigraphy, which is widely used for the diagnosis of splenosis, can be a useful tool for checking the viability of the grafted splenic tissue after the operation. Fig. 1. 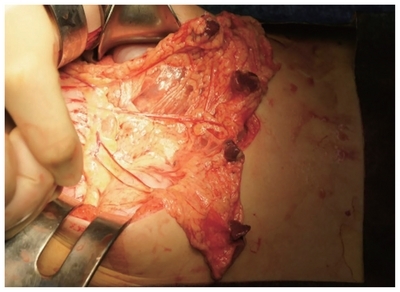 Spleen graft was implanted in greater omentum. Fig. 2. 99mTc-labeled heat-denatured red blood cell (99mTc-RBC) radioscintigtaphy presented viable transplanted spleen. ANT: anterior, ABD: abdomen, POST: posterior, LPO: left posteior oblique, LT-LAT: left lateral. RBC: red blood cell, PB: peripheral bleed, POD: post operation day, M: male, F: female. Unit of platelet count is ×103/μL. Normal means that no Howell Jolly body was seen. Stassen, NA, Bhullar, I, Cheng, JD, Crandall, ML, Friese, RS, and Guillamondegui, OD (2012). Selective nonoperative management of blunt splenic injury: an Eastern Association for the Surgery of Trauma practice management guideline. J Trauma Acute Care Surg. 73, S294-300. Pisters, PW, and Pachter, HL (1994). Autologous splenic transplantation for splenic trauma. Ann Surg. 219, 225-35. Shatz, DV (2002). Vaccination practices among North American trauma surgeons in splenectomy for trauma. J Trauma. 53, 950-6. Massey, MD, and Stevens, JS (1991). Residual spleen found on denatured red blood cell scan following negative colloid scans. J Nucl Med. 32, 2286-7. Tzoracoleftherakis, E, Alivizatos, V, Kalfarentzos, F, and Androulakis, J (1991). Complications of splenic tissue reimplantation. Ann R Coll Surg Engl. 73, 83-6. Moore, FA, Moore, EE, Moore, GE, and Millikan, JS (1984). Risk of splenic salvage after trauma. Analysis of 200 adults. Am J Surg. 148, 800-5. Büyukünal, C, Danişmend, N, and Yeker, D (1987). Spleen-saving procedures in paediatric splenic trauma. Br J Surg. 74, 350-2. Mikó, I, Bráth, E, Furka, I, Kovács, J, Kelvin, D, and Zhong, R (2001). Spleen autotransplantation in mice: a novel experimental model for immunology study. Microsurgery. 21, 140-2. Petroianu, A, and Petroianu, LP (2005). Splenic autotransplantation for treatment of portal hypertension. Can J Surg. 48, 382-6. Di Carlo, I, Pulvirenti, E, and Toro, A (2012). A new technique for spleen autotransplantation. Surg Innov. 19, 156-61.